The Cumberland Cruisers heading towards a pot of gold at the end of the rainbow. It truly is remarkable to see the same teams clipping-in year after year. Of note, the fixed-gear Sinister Nuts, led by Bill Olsen has participated in all seven PA Fleches. And again this year, with more than five fixed-gear riders looking for a spot on his roster, another fixed-gear team, "Fear of Gears", was formed under the leadership of Bill Fischer -- who also notched his 6th PA Fleche finish. Guy Harris is another six-time finisher (and most likely would also have seven finishs if not for a certain volcano that erupted a couple of years ago and disrupted his travel back from the U.K). Also in the six-time finisher club is Cumberland Cruiser captain, Walt Pettigrew, and fellow cruisers Dawn Engstrom and Rick Lentz. Sinister Nut, Paul Scearce, also has a high number of finishes at five, with several others completing their fourth and third fleches. Once again in the second year in a row, team "Now You've Gone Too Far" led by Eric Keller gets my vote for the biggest over-achievers. Starting in Boalsburg, PA (near State College), their route generally followed the 3rd and 4th days of the Endless Mountains 1240k. But this year, the challenges of a hilly route were somewhat offset by favorable winds. Eric posted: "...I don't know how my team managed to survive the hardship of 210 out of 228 miles of vicious tailwinds. I might have to change the name of my team to, "I love it when a plan comes together" ..."
Nigel writes: "..Thanks for hosting another great Fleche ride. Despite the threat of afternoon storms, the weather turned out mostly sunny with a morning tailwind. We only got a sprinkle of rain and it came at just the right time for me to change my flat tire under cover. In between the many little mechanicals (3 flat tires, one front brake malfunction, one seat rail bend and one uncooperative headlight. I was able to take a few pictures and video. I cobbled them together to make a 3 m 40s little video of the Escargot Volant ride ..."
Rick Lentz writes: "... I had a great time again this year. It seems to be that I feel pretty good every Fleche. Must be the time of the year. .... I cursed the weatherman and his increased rain forecast all the way to the start, but weatherman who are wrong are often wrong about being wrong. Having about 10 miles of rain for the whole ride was certainly a bonus. The 40s temps for most of the later part of the ride would have been much worse if we were soaking wet too. The sun after the rain provided for some nice rainbow shots. ... The pot of gold at the end of the rainbow over to the northwest ended up being that tortellini soup Tom had at the hostel. ..."
Bill Olsen writes: "...Thanks for again hosting the PA Flèche this year. It's always a pleasure to get together for our Sinister Nuts 24-Hour Biking party and also get to see the other teams that reconvene every year. Each team has their own set of stories from their rides, and the stories get better upon each retelling. It was especially gratifying when we crossed paths with the Fear o'Gears team all decked out in their matching PA Randonneurs jerseys. As they made their way down the Jersey shore and back to the Quakertown finish, a lot of folks must have been wondering if they REALLY rode their bicycles all the way from Pennsylvania...."
Guy Harris writes: "...Thanks once again for putting on the fleche. The more I do these the more I look forward to them. Like spring and baseball now. Your post-ride feast was my excuse to replace a big nutritious breakfast at Mueller's with two big donuts from the store side of the restaurant since I knew your great food was 2 hrs down road. ..."
Greg Keenan writes: "... My 12 year-old daughter (who is just beginning to pull-a-teenager and think her dad is very strange) gave me a great quote when she saw the pictures. She saw the pictures of Dan and Keith napping on the Wa-Wa floor and immediately said.... 'doesn't that kind of make you like a hobo?' Day glow yellow hobo's or not, we made quite a westerly arrow with the help of a perfect tail wind. According to wikipedia: "A west wind is a wind that blows from the west, in an eastward direction. In Western tradition, it has usually been considered the mildest and most favorable of the directional winds." Most favorable I agree. ..."
Tinicum farmhouse in the fading sunlight. There could hardly be any complaints with the weather for this event. Temperatures at the start were in the high 40F's, and with the plentiful sunshine, it quickly warmed up to a pleasant 70F. But despite the recent warm-up, some piles of snow were still hanging on all along Riverton Road, just north of Belvidere. The winds for much of the day were gentle but picked up later in the afternoon -- adding to the challenge of all those rollers through Bucks County on the last segment to the finish. All 28 riders on the roster finished in good time for another 100% finish -- congratulations to all the participants for that excellent result on arguably, one of the toughest 200k's you'll find anywhere. And adding to the difficulty, a cuesheet error had a number of riders logging bonus miles riding up and down a ridge looking for River Road atop of the Lommasson's Glen/Buckhorn/Castner climb. 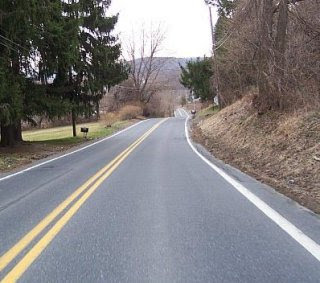 I heard reports of one rider going part way down Fiddlers Elbow, which of course, is one of the steepest roads around the area. Also in the category of bonus miles, of the hilly variety: Don Jagel must have had last October's 200k route in mind when he arrived at Geigle Hill Road. Instead of taking the left turn to the covered bridge, he instead turned right and traversed the Geigle Hill ridge and eventually arrived at Creamery Road in Ottsville the same as everybody else. But then realizing his error at that point, he retraced his route all the way back to the covered bridge in order to get to Creamery Road the correct way, logging nearly 13 miles and two crossings of Geigel Hill in the process! Don explains: "...When Jim H. and I got to Geigel Hill Rd., being such a nice day, and with plenty of time to spare we turned right so we would not miss getting in the last good climb of the day. Only after we crossed Durham Rd. in Ottsville, and passed below the Route 611 over pass did I go to flip over my cue sheet and realize that we were really supposed to turn left at Geigel Hill Rd. and follow Headquarters Rd. to Ottsville. So, we made the trip back down Geigel Hill Rd., and got back on the proper course eventually ending up on Creamery Rd. again, where we had turned around earlier. I think we deserve the 10% bonus mileage award for that one (yep, it was a full 12.6 miles detour)! That was definitely a personal record for me. To make matters worse, Jim and I had been talking about Geigel Hill earlier during the day, and Jim even pointed out the Geigel Hill cue to me when we were in Milford. Oops! ..."
In light of that exemplary adherence to the rules, Don and Jim win the Honest Abe 10% Bonus award. Don additionally writes: "... Once back on track, Craig M. caught up with us. Craig had his bonus mileage up by Brass Castle Rd. where went down to hills by mistake before finally finding the right way. As we closed in on Lake Nockamixon we picked up Robin L., so we finished as a group of four, as Jim and I congratulated each other on completing the long 200k. When we got back to the hostel Patrick had the lasagne warm and waiting, which was well needed. Thanks Patrick!...Looking forward to the PA300 (without the 10% bonus mileage)..."
Jim Holman adds: "...Extra miles or not, it is always great to ride with Don. I also enjoyed riding with CJ up to the Milford controle where we split up... the route was beautiful! Challenging and scary :-) at the same time. The food and refreshments at the hostel were most welcome after such a difficult ride. Many thanks to you and your volunteer crew (Patrick and Cecilie)! And Thanks also for the Honest Abe Award...."
Nigel Greene writes: "...When I saw the route profile, I was expecting a challenging course, but reality exceeded the expectations. I am glad I had a great-granny gear as good balance to keep me from falling over as I was riding at walking speeds up those many rides. Great weather, beautiful course, good food at the beginning and end. All in all another PA pleaser and good confidence builder...."
... is one of the things that helps me keep going as an RBA! Ed Bernasky writes: "... When trying to decide whether to do yesterday's 200k or drive down to DC for a 300K, I was torn. Needing a good hard ride and previewing the cuesheet illuminated that you "took" Blue MOUNTAIN from us sending us over the Appalachian trail the easy way THAT time but we were ultimately compensated with the smattering of those cute little rollers along the way over the last 2/3 of the route. Seriously.... beautiful, challenging route with just the right amount of gravel sprinkled in. The long, difficult stretch from the Portland to Milford Controles was good training (nutrition and hydration) for any (new) randonneur. Is there a more challenging and beautiful 200k routes out there? Is there? Thank you. (I think) ..."
Chris Newman writes: "..Thanks for a challenging ride - all of my favorite hills in one 200K! And thanks to Patrick for manning the finish. ..."
First finisher Norman Smeal writes: "... yesterdays ride was for sure a test. .... Again, the weather gods were watching over us and gifted the PA Randonneurs another perfect day. I want to thank you, Patrick and Cecilie for the pre-ride notes and Patrick for being there at the finish....."
Bill Olsen writes: "...Thanks for running this "old standard" route again this year. It always brings back fond memories of my riding this as my second brevet, ever. The hills keep coming, and although your ears may have been burning from all of us out on the route today, we'll all thank you later in the season for providing this opportunity to kick start our training for the events of the upcoming season. Thanks also to Patrick and Cecilie for pre-riding the course and also for Patrick for volunteering to check us all in at the finish....."
Special thanks to both Cecilie and Patrick Gaffney for checking out the course with their volunteer preride. Patrick also ran the finish controle, provided the postride meal, and helped with the cleanup at the end. Having all that good help allowed me to enjoy a fantastic day on the road with all the others -- thanks! The Eastern PA spring series continues in two weeks with 6 Fleche teams headed to Quakertown from various starting points. And the week after the fleche, you have the choice of either a 300k or 200k on May3rd. Details will be posted shortly. "...the PA200K was my favorite route in PA so far. Not only challenging, but also scenic..." -- Juan Salazar commenting on the 2009 event. This is the event with several big climbs including: Fox Gap, Lommasson's Glen, Staats, and new for this edition, Dogwood Lane on our way to Easton. Along with all those climbs, there are of course some long, steep descents -- while it may be possible to reach 50 MPH on some of these descents, please don't go any faster than your Guardian Angel can keep up with. Especially in light of the rough winter we've had, which has left behind many potholes and rutted pavement that has yet to be patched up. There are several stretches of road where you'll need to pick your way around these hazards, so please keep a safe distance from the rider in front of you, especially early on when riders tend to be bunched together. A volunteer pre-ride was completed by Patrick and Cecilie Gaffney. Patrick reports: "...Cecilie and I had a great time yesterday, though the stiff head winds for about the first 60 miles were as formidable as any of the climbs. Wind Gap really live up to its name! Overall we found the roads of the course to be in pretty good shape given the winter we had. I would say that the worst stretch of roads were in the first 13 miles; lots of potholes and gravel. Once you make the left on to Dogwood Ln there were noticeably less potholes. The first 13 miles were not so bad that you couldn't pick your way through, but we were one bike going pretty cautiously. It may be more difficult for a pack of riders to get through as easily. You may want to warn everybody to leave plenty of space for maneuvering. There was a lot of gravel on the right turn onto Cherry Valley Road as well as on some other turns. I liked the new routing ... While the climbing on Dogwood Lane seems to sneak up on you I thought it was a more pleasant way to the top of the ridge than the old routing up Lower Saucon Road. There will certainly be less traffic which is always nice and it doesn't seem to be a steep a grade. ..."
The current cuesheet is draft 1, dated 3/26/14 (there were no edits from the voluteer preride). The start/finish is at the Weisel Hostel in Quakertown, our "rando clubhouse". There are dorm rooms available for $25/night on both Friday and Saturday nights -- if you are traveling far, this might be a cost effective option to consider to avoid a lot of driving right before and after the event. A breakfast buffet of hot oatmeal and other breakfast items is available 1 hr before the start, in the hostel's great room. This is also where the sign-in area is. After the ride, there are 2 showers available in the upstairs bathroom. Also included is a postride meal, where you can swap your war stories and share your goals for the 2014 season. Please drop me a note by Thursday, if you want to join the roster.